relaxation. We suggest the CalaPonte Hotel for all those in need of a break from the daily grind. 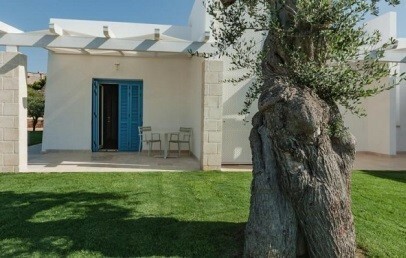 The typical countryside ambience of Puglia embraces CalaPonte Hotel, just a few hundred metres from the tourist port of Polignano a Mare, set among ancient olive trees, trulli (the typical cone-roofed buildings of Puglia) and dry-stone walls. The resort is just 5 km from the historic centre of the coastal town and within easy reach of the main attractions in the area. CalaPonte Hotel is set in the rolling countryside of Puglia and its white architectural forms, essential and sober, provide a fine homage to the local farmhouses or “masserie”. The structure opens outwards with a series of fine patios bathed in sunlight, while dry-stone walls and gnarled olive trees mark off the horizon. In the heart of the garden, a large pool offers a cool haven round which to while away the summer afternoons. 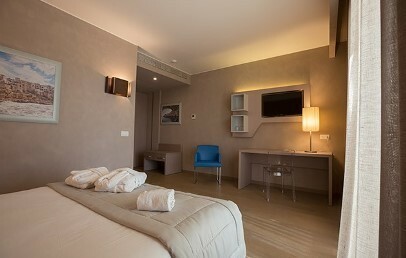 The 58 rooms of the hotel are stylish and comfortable, and face the garden with furnished patios or private balconies. Great care has been lavished on these rooms, which are large and well lit, marked by a simple, modern style. 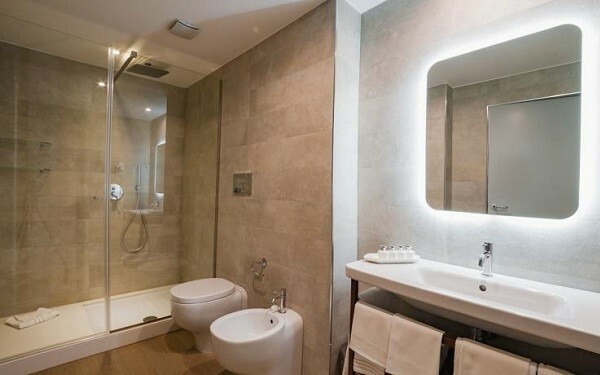 All rooms have their own AC system, complimentary Wi-Fi connection, TV, minibar and safe. A true pleasure for our guests to rediscover peace and quiet after a long day by the sea or an excursion to discover the territory. Awaiting our guests are the pleasures of the Spa, which offers a number of services, such as sauna, Turkish bath, Jacuzzi pool, Kneipp route, heated armchair, icy waterfall and relaxation area with salt wall. Beauty treatments and massages are available with payment of a supplement. The price of your stay is inclusive of Wi-Fi connection, vehicle parking and access to the pool and common areas. The Resort is set in the vicinity of the marina of the same name which, apart from boat handling and management services, offers rentals, excursions and guided visits. Great care has been lavished on these rooms, which are large and well lit, marked by a simple, modern style. Set near the pool, the Deluxe rooms are comfortable and stylish with a canopied double bed or two singles. This room can accommodate up to max. 2 adults and 1 child until 11 years. Great care has been lavished on these rooms, which are large and well lit, marked by a simple, modern style. The stylish Suites comprise two large rooms, equipped with a double bed, a double divan bed, AC, 2 TVs and a well-equipped en-suite. Great care has been lavished on these rooms, which are large and well lit, marked by a simple, modern style. Set near the pool with a terrace. 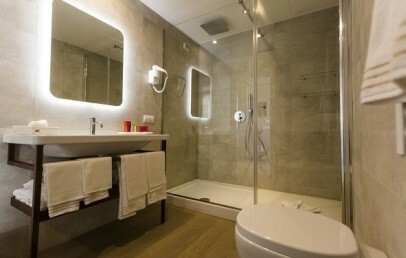 The Deluxe rooms are comfortable and stylish and with a bathroom with big shower. These rooms are situated either in the gardens or in the main building with direct lift access down to the spa. All are furnished in a minimalist style, some with a four poster bed, parquet and bathrooms with spacious walk-in showers. These deluxe rooms include the access to the Spa. 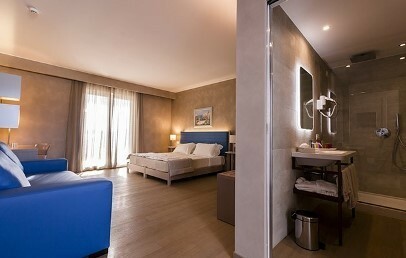 Spacious room, furnished with great care marked by a simple, modern style. 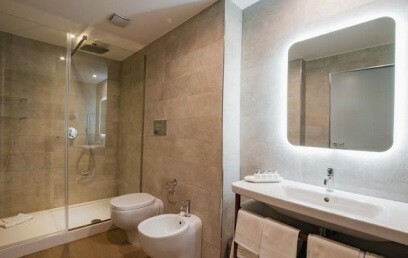 The Executive are comfortable rooms with a sofa bed for a third person and a big bathroom with tub. Great care has been lavished on these rooms, which are large and well lit, marked by a simple, modern style. The Deluxe rooms are comfortable and stylish with a canopied double bed or two singles. The rooms overlook the pool area.